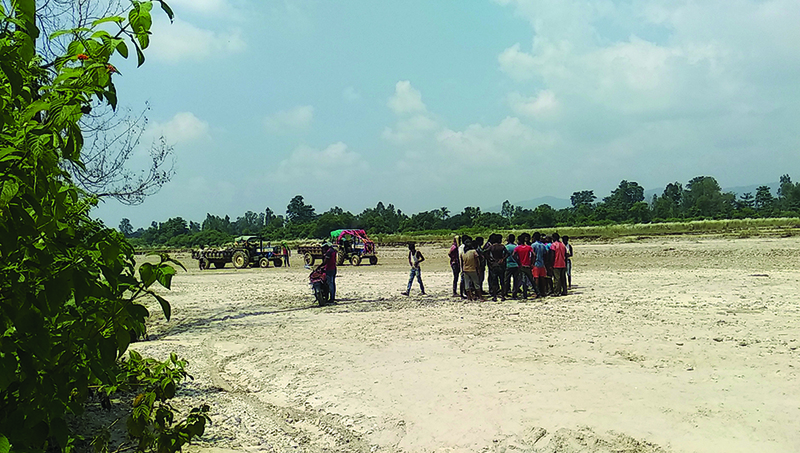 Mithilesh Yadav/Republica Locals of Golbazar Municipality-10, Siraha protest against mining of sand and stones from the Ghurmi River on Tuesday. Two tractors were forced to unload after officials from the District Forest Office confirmed that the river was a designated Chure conservation area. SIRAHA, Sept 19: Some years back, Shuka Bahadur Khulal Magar's home was so far from the Khurma River that his family had literally no fear of floods. However, over the years, his home has come close to the river. He claims that the river changed its course because of the rampant and unregulated excavation of sand and stones from the riverbed by crusher plants. "Crusher plants in the area have been rampantly mining sand and stones from the river banks incessantly over the years. Such unregulated mining of sand and stones from the river's bed and banks have changed the course of the river over the years. The changed course of the river is now threatening the future of our whole settlement," he explained. "The river flows so near to our house nowadays that we all fear a lot these days. Disaster could hit us anytime," he added. Following massive reporting on haphazard destruction of Chure range and mining of sand and stones from rivers, in 2014 the government had designated certain areas in the Chure Range as conservation area. Along with that, it also introduced environment conservation measures. "We all were concerned with the haphazard mining of stones and sand in the river. They excavate sand and stones from the river day and night," said Magar. "We shared our concerns with authorities concerned and urged to take actions against the crusher plant operators. But no effective action was ever taken to restrict them," he added. Ghurmi River has not only 'widened' but also has changed its course. Including that of Magar, there are 70 households of erstwhile Chandrodaya VDC– 7 (present day Golbazar Municipality -10) that could be washed away by the river any time. The settlement that is situated at the base of the Chure range could be washed away by the river at any time in the blink of an eye, locals assert. "It is not hard to figure out that the disaster is at the door. The river is slowly inching closer to our settlement. It has deformed. If anything wrong happens, who will save us?" wondered Padam Bahaduar Sunuwar, another resident of the settlement. "Even though there are several government bodies responsible for conserving the Chure range, it's destruction continues unabated," he added. It is not just the village of Magar and Sunuwar that the river and the deteriorating environment are challenging. Shrinking forest and 'unnatural' courses of the rivers have affected dozens of villages in the plains as well. The Chure range touches 36 districts across the country and environmentalists claim that water scarcity, floods and landslides are now a regular phenomenal in almost all the areas. "We had expected that things would be different after the elected local representatives would assume office. But they fooled us once again by making tall promises," lamented Sunuwar. "When our own representatives, who were born and raised here, are not concerned with the degradation of our environment, why would others care to conserve our jungles and rivers? We are very disappointment with the performance of our local bodies," he shared. Even though the government has not lifted ban on extraction of aggregates from the Chure region, some local bodies have started doing it. Though they have not lifted the ban officially, they have a many times argued that the 'local resources are under their domain'. As such, the local body has neither studied the environmental impact of operating crusher plants in Ghurmi River nor tried to stop ongoing excavation. On Tuesday, locals had gathered at a similar site and protested. They warned the truck drivers and other workers to stop mining sand and stones right away. However, the workers resisted the locals thereby forcing the locals to get assistance from the police. Led by Sub Inspector Uttar Shrestha, a police team reached the site and later on called officials from the district forest office. The protest ended in favor of the villagers. 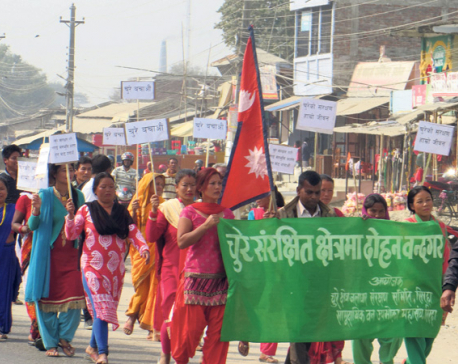 Chure conservation was one of the most popular agenda of election candidates during the local and provincial elections. The agenda was also discussed with great importance in provincial cabinet meetings. However, locals feel that such discussions have not brought any visible changes in restricting excavation of natural resources from the conserved Chure range.